The reverseGeocode operation determines the address at a particular x/y location. You pass the coordinates of a point location to the geocoding service, and the service returns the address or place that is closest to the location. The parameters for reverseGeocode are listed in the subsections that follow, categorized by required and optional parameters. The point from which to search for the closest address. The point can be represented as a simple, comma-separated syntax or as a JSON point object. The spatial reference of the comma-separated syntax is always WGS84 (in decimal degrees), the same coordinate system as the World Geocoding Service. Use JSON formatting to specify any other coordinate system for the input location. Specifically, set the spatial reference using its well-known ID (WKID) value. For a list of valid WKID values, see Projected coordinate systems and Geographic coordinate systems. The service supports responses in JSON or PJSON format. You can specify the response format using the f parameter. This is a required parameter. The token parameter may or may not be required; read about free vs. paid operations to learn when it is required. Use this parameter to specify a token that provides the identity of a user who has the needed permissions to access the service. The authentication topic provides more information on how to generate an access token. The spatial reference of the x/y coordinates returned by a geocode request. This is useful for applications using a map with a spatial reference different than that of the geocode service. The spatial reference can be specified as either a well-known ID (WKID) or as a JSON spatial reference object. If outSR is not specified, the spatial reference of the output locations is the same as that of the service. The World Geocoding Service spatial reference is WGS84 (WKID = 4326). For a list of valid WKID values, see Projected coordinate systems and Geographic coordinate systems. Sets the language in which reverse-geocoded addresses are returned. Addresses in many countries are available in more than one language; in these cases the langCode parameter can be used to specify which language should be used for addresses returned by the reverseGeocode operation. This is useful for ensuring that addresses are returned in the expected language. For example, a web application could be designed to get the browser language and pass it as the langCode parameter value in a reverseGeocode request. See the table of supported countries for valid language code values in each country. The Supported Language Codes column provides the valid input values for the langCode parameter. Full language names cannot be used with the langCode parameter. Only one language code value can be included for the langCode parameter in a reverseGeocode request. The language code EN should be used for returning transliterated or transcribed versions of a language, or for returning Pinyin. The Supported Languages column indicates the countries for which such languages are available. The default language code for each country is the first one listed in the Supported Language Codes column, highlighted with bold text. It is the default language of addresses returned by the reverseGeocode operation for a particular country. For countries with multiple supported languages, the default language is the one spoken by the highest percentage of the country's population. For some countries, not all addresses are available in the default language. If the langCode parameter isn't included in a request, or if it is included but there are no matching features with the input language code, then the resultant match is returned in the country's default language code. Both English and French are listed as supported languages for Canada. However, there is no overlap between the languages for any addresses in most provinces. In the province of Quebec, only French addresses are available, while English is the only language used for addresses in Ontario. In Belgium, where three languages are supported (Dutch, French, and German), addresses are available in the City of Brussels in both Dutch and French. However, in the majority of the country only a single language is used for addresses. In Greece there is complete address coverage in both Greek and transliterated Greek languages (Greek words translated with Latin characters). Due to variability of language coverage, the following logic is used to handle the different scenarios that may be encountered. No langCode value is specified and only one language is supported at the input location. No langCode value is specified and multiple languages are supported at the input location. An invalid langCode value is specified and only one language is supported at the input location. A langCode value is considered invalid if it is not supported for the given country. An invalid langCode is specified and multiple languages are supported at the input location; the input langCode is a Latin-based script and a transliterated address exists at the location. Address is returned in the transliterated language. An invalid langCode is specified and multiple languages are supported at the input location; the input langCode is not a Latin-based script. Specifies whether the results of the operation will be persisted. The default value is false, which indicates the results of the operation can't be stored, but they can be temporarily displayed on a map, for instance. If you store the results, in a database, for example, you need to set this parameter to true. Applications are contractually prohibited from storing the results of reverse-geocoding transactions unless they make the request by passing the forStorage parameter with a value of true and the token parameter with a valid ArcGIS Online token. Instructions for composing a request with a valid token are provided in Authentication. 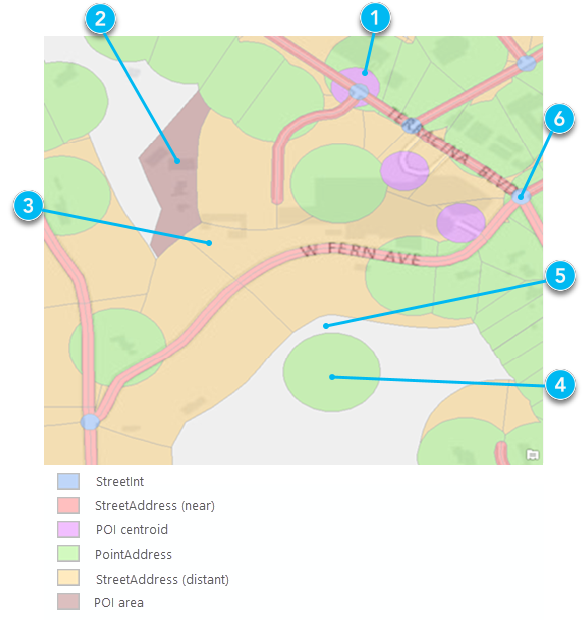 ArcGIS Online service credits are deducted from the organization account for each geocode transaction that includes the forStorage parameter with a value of true and a valid token. Refer to the ArcGIS Online service credits overview page for more information on how credits are charged. To learn more about free and paid geocoding operations, see Free vs. paid operations. Limits the possible match types returned by the reverseGeocode operation. Valid values are listed in the feature type hierarchy table. Single or multiple values can be included in the request. If a single value is included then the search tolerance for the input feature type is 500 meters. If multiple values are included then the default search distances specified in the feature type hierarchy table are applied. The list below includes the valid values for the featureTypes parameter. Use featureTypes=StreetInt instead of the returnIntersection parameter to return intersection matches. Intersection matches are only returned when featureTypes=StreetInt is included in the request. The label for StreetAddress matches includes the house number range for the matching street segment, rather than the interpolated house number value. For instance, reverseGeocode with input location -117.196324,34.059217 returns a StreetAddress match with Match_addr=1001-1199 W Park Ave. This means that the matching segment has a possible range of house numbers from 1001 to 1199. If more than one value is specified for the parameter, the values must be separated by a comma, with no spaces after the comma. The returnIntersection parameter is only included for backwards compatibility. The new featureTypes parameter should be used instead of returnIntersection. Specifically, if you want to return the nearest street intersection to the input location, pass featureTypes=StreetInt in the reverseGeocode request. A Boolean that indicates whether the service should return the nearest street intersection to the input location. If true, then the closest intersection to the input location is returned; if false, then the closest address or place to the input location is returned. The default value is false. returnIntersection=true is equivalent to featureTypes=StreetInt in a reverseGeocode request. Specifies whether the output geometry of PointAddress matches should be the rooftop point or street entrance location. Valid values are rooftop and street. The default value is street. Geocode results include one geometry object (the location object) which defines the location of the output address. By default the geometry returned for geocode results represents the street entrance location of the address. This is useful for routing scenarios because the rooftop location of some addresses may be offset from a street by a large distance. However for map display purposes it may be desirable to show the rooftop location instead, especially when large buildings or landmarks are geocoded. For these cases the locationType parameter can be used to specify that the rooftop geometry should be returned. The locationType parameter only affects the location object in the geocode JSON response. It does not change the X/Y or DisplayX/DisplayY attribute values. The purpose of reverse geocoding is to answer the question "What's near me?". Or more specifically "What's near this location?". To best answer this question, the reverseGeocode operation returns the most relevant feature near an input location based on a prioritized hierarchy of feature types. With a few exceptions, the same feature types that can be returned by findAddressCandidates can also be returned by reverseGeocode. As long as the location is within a supported country, a single feature is always returned, even if the location is far from any streets or places. If there are no streets near the input location then large areal features such as parks, universities, zoos, or airports may be returned. If the location isn't within the boundary of this type of feature then a postal code or administrative area (such as a city) is returned. The hierarchy is summarized in the table below, ordered by descending priority. Unless otherwise noted, each feature type is only returned when the distance between the input location and the feature is within the tolerance specified in the Search Tolerance column. The label for StreetAddress matches includes the house number range for the matching street segment, rather than the interpolated house number value. For instance, reverseGeocode with input location -117.196324,34.059217 returns a StreetAddress match with 1001-1199 W Park Ave. This means that the matching segment has a possible range of house numbers from 1001 to 1199. Intersections are only returned when featureTypes=StreetInt is included in the request. Candidates of type StreetName are only returned if featureTypes=StreetName is included in the request. A business or landmark that can be represented by a point. A PointAddress match is not returned if it is on the opposite side of the street as the input location, even if it is within 50 meters of the location. A business or landmark that can be represented by an area, such as a large park or university. Not available in all countries. If the input location intersects multiple boundaries, the feature with the smallest area is returned. The images below should help with visualizing the reverseGeocode feature type hierarchy. 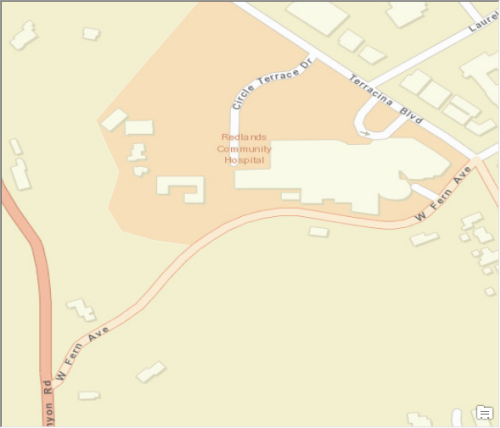 The following image shows a section of a typical map on which a user may click or add points for reverse geocoding. 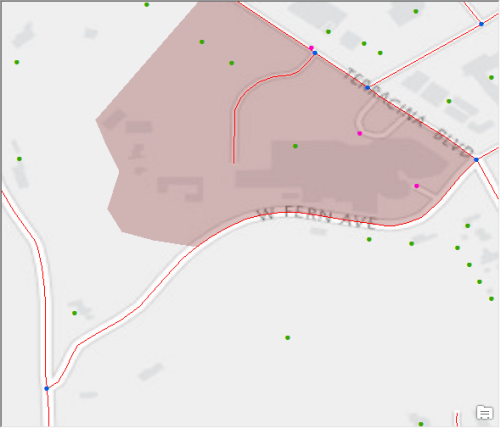 The following image shows what the same map looks like with the available features for reverse geocoding highlighted: blue dots for StreetInt features, pink dots for POI centroids, green dots for PointAddress features, red lines for street segments, and a brown polygon representing a POI area feature. In the following image, buffers have been created around the different features based on the search tolerance values from the hierarchy table to illustrate the match types that would be returned for various reverseGeocode input locations. Refer to the following examples to see the expected matches for the input locations in the image. For each number callout in the image above there is a corresponding example with the same number. In this example, which corresponds to callout 1 in the graphic above, the input location is within the search tolerance of both POI and PointAddress features, but a match to the POI centroid is returned because it has a higher priority. In this example, which corresponds to callout 2 in the graphic above, the input location is within a POI area feature, so a POI match is returned. In this example, which corresponds to callout 3 in the graphic above, the input location intersects a POI area feature and a StreetAddress buffer. A StreetAddress match is returned since it has a higher priority than POI areas. In this example, which corresponds to callout 4 in the graphic above, the input location is within the search tolerance of a PointAddress feature, so a PointAddress match is returned. In this example, which corresponds to callout 5 in the graphic above, the input location is outside the tolerance of address and POI features, so the service returns a match to the smallest (by area) administrative or postal boundary feature that the location intersects. In this case a match to Live Oak Canyon neighborhood is returned. In this example, which corresponds to callout 6 in the graphic above, the input location is within the tolerance of both StreetInt and StreetAddress features. Even though StreetInt has a higher priority than StreetAddress, a StreetAddress match is returned. This is because intersection matches are only returned by reverseGeocode if the request includes featureTypes=StreetInt. The featureTypes parameter is empty in this particular case. The World Geocoding Service is configured to return the most relevant address or place for a given reverseGeocode input location. However, as a developer of an application that uses reverse geocoding, you may want to have more control over reverse geocode results. For instance, you may want users of your application to choose the features that are returned when they reverse geocode a location. Or perhaps the search tolerances mentioned in the previous table aren't sufficient and you want more distant addresses to be returned. Maybe you want to return StreetInt matches. You can use the featureTypes parameter to satisfy such requirements by refining reverse geocoding results. The featureTypes parameter can be used to specify one or more match types to be returned by a reverseGeocode request. If one value is included for featureTypes, then the search tolerance is extended to 500 meters. If the featureTypes parameter includes multiple values then the search tolerances defined in the feature types hierarchy table are used. Details for the logic used by the featureTypes parameter are described below. If featureTypes is blank, the match is based on the default feature type hierarchy and search tolerances defined in the feature type hierarchy table, excluding StreetInt. StreetInt matches are only returned if featureTypes=StreetInt is included in the reverseGeocode request. If featureTypes includes a single value, then a search tolerance of 500 meters is used and only the input feature type is searched for. If the input feature type exists within 500 meters of the input location then a match to that feature is returned. If there are no matches to the input feature type within 500 meters of the input location then no match is returned for the reverseGeocode request. If featureTypes includes multiple values, the default search tolerances for the input feature types as defined in the feature type hierarchy table are used to determine the match. If the input location is within the search tolerance of only one of the input feature types, then a match to that feature type is retuned. If the input location is within the search tolerance of multiple input feature types, then a match to the input feature type with the highest priority is returned. If the input location is not within the search tolerance of any of the input feature types then no match is returned. Review the following examples to see how featureTypes can be used in different scenarios. In this example we'll use the featureTypes parameter to return a StreetInt match with a reverseGeocode request. This example uses the same input location as example 6 above. In this example we'll use the featureTypes parameter to return a match to a PointAddress feature when the input location is outside the default PointAddress search tolerance. Because PointAddress is the only value included for the featureTypes parameter in this reverseGeocode request, the search tolerance is 500 meters, which allows more distant PointAddress matches to be returned. In this case if featureTypes is not included in the request a Locality match is returned instead. A typical use case for the featureTypes parameter is to exclude matches to non-address features, which can be accomplished by setting featureTypes=PointAddress,StreetAddress. In this example the input location is within the search tolerance of both POI and PointAddress features, but a match to the PointAddress is returned because featureTypes is used to exclude the POI match. This example uses the same input location as example 1 above. In this case if featureTypes is not included in the request a POI match is returned. Greek is the default language for features in Greece. However, many features are also available in English. This example shows how to return English reverse geocoding results for locations in Greece. In Israel, some addresses are available in both Hebrew and Russian languages. Hebrew is the default language, so langCode=RU must be included in the reverseGeocode request to return matches in Russian.